The Community Design Collaborative in partnership with Partners for Sacred Places is excited to announce the next phase of Infill Philadelphia! Sacred Places/Civic Spaces is designed to foster a growing dialogue about the intersection between historic sacred places and communities. Three religious sites across Philadelphia have been selected, along with community partner organizations, to serve as models for incorporating civic spaces into active sacred places. Three design teams have been chosen and paired with each to re-envision the purpose-built religious properties as community hubs. These partnerships will help strengthen relationships between sacred places, community organizations, and service providers with a mutual interest in co-location and cooperation. properties in neighborhoods and offer alternative options. existing uses for community benefit. The Philadelphia Masjid serves a congregation of 500, while also acting as a central hub for many others in the Muslim community. The 1.5-acre former Diocesan school complex has been underutilized since the closing of the Sister Clara Muhammad School over ten years ago. The site offers the potential for both renovation and new construction, and the congregation hopes to use its excess space to meet the needs of the neighborhood and lay the foundation for a broad community development initiative. The Philadelphia Masjid envisions the use of the classroom building for workforce training programs and sees the potential for redevelopment of the vacant schoolyard as affordable, multi-generational housing. People's Emergency Center recognizes this site as a key opportunity within the Promise Zone and as a significant gateway to the neighborhood. Wharton-Wesley United Methodist Church, embedded in the surrounding residential fabric, once had a congregation of 700. Today, most of its 150 members travel from outside the neighborhood to attend services. High utility costs and aging infrastructure make the church and Sunday school building costly and challenging to maintain. The congregation is attuned to the challenges faced by the surrounding community and is eager to put "less into capital, more into ministry." Having just completed a strategic planning process, it is positioned to maximize the value of its building as a community resource through partnerships with other congregations. ACHIEVEability is eager to increase the impact of its work to improve the lives of residents in the Haddington/Cobbs Creek neighborhood through a partnership with Wharton-Wesley. Design Partner: Studio 6mm (lead); Kate Cowing Architect LLC; Keast & Hood; Burns Engineering, Inc.; International Consultants, Inc.
Zion Baptist Church has a rich history that includes the legacy of The Reverend Leon Sullivan, a national and international leader in the civil and human rights movements, who served as pastor for 37 years. 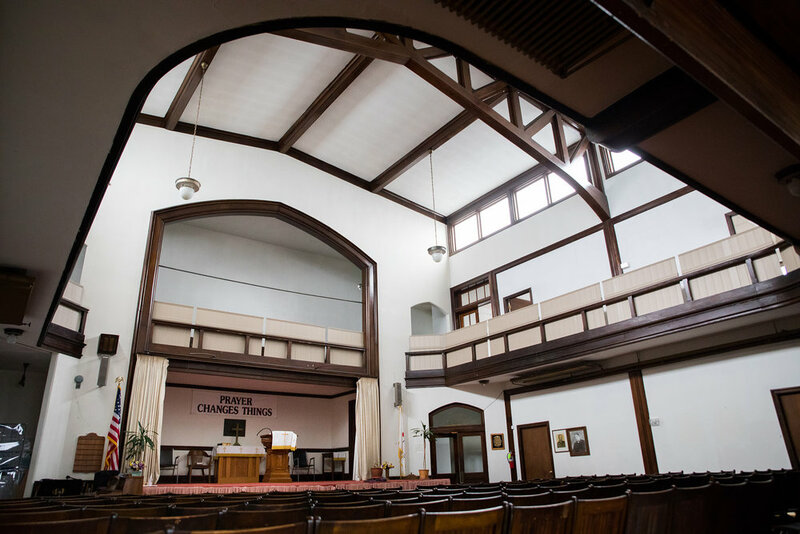 The congregation has strong ties to the community and its two buildings - the 1970s contemporary building where it worships and the 1920s "annex" which housed the church's outreach programs until recently. The buildings are located directly across the street from each other and just one block from the intersection of Broad, Germantown and Erie, a key location along the North Broad Street commercial corridor. 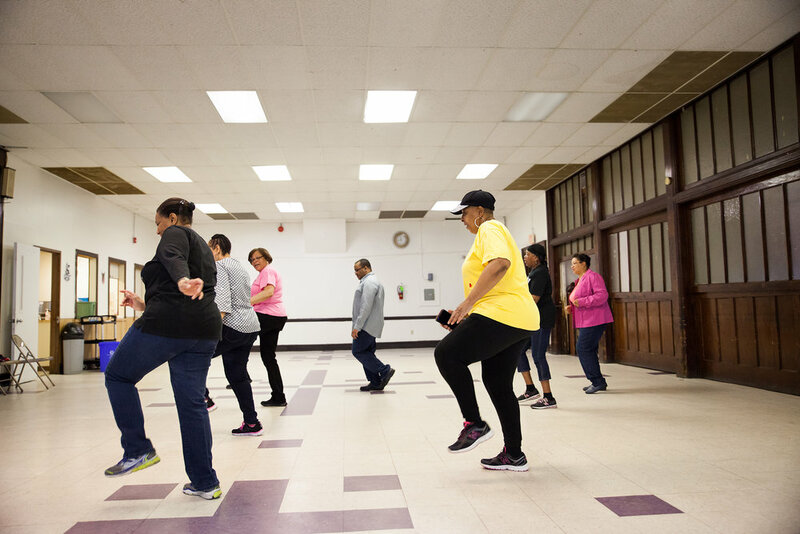 Zion hopes to reactivate the vacant annex as a part of the commercial corridor's revitalization, an effort led by Zion Baptist's community partner, Called to Serve Community Development Corporation.